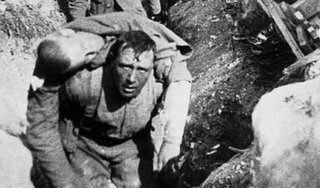 The Imperial War Museum London, supported by The History Channel, is offering a unique opportunity to see a screening of The Battle of the Somme (1916), with the premiere of an orchestral accompaniment composed by Laura Rossi and performed by the Philharmonia Orchestra. The Battle of the Somme was the first British offensive of the First World War to which cameramen were given access, in order to film the front line action as it took place. The resulting 80-minute film, released in Britain in 1916, made an enormous impression on the public and was seen by at least half the population. Audiences were greatly impressed by the film's realism, as well as being traumatised by the candid and unprecedented images of British wounded and dead. Scenes from this film are regularly used in television programmes about the First World War, but few people have had the opportunity to experience this 'silent' film as it might have been seen by its first audience on a visit to a wartime picture house - at full length, on a large screen and supported by a live musical accompaniment. In recognition of the film's importance as documentary record, The Battle of the Somme has recently been inscribed on UNESCO's 'Memory of the World' register.